Ladybugs have held my attention lately. There’s been so many of them. and the shed of another one was the other trunk. There were several of different sizes on the bark of the three maple trees in our backyard. I doubt if their nymphs are pestered by other insects! Their spines look like they mean business. This is a younger, smaller instar. 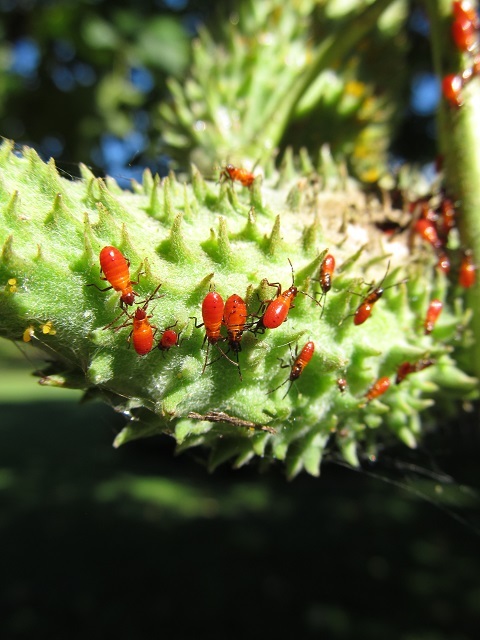 Ladybugs do overwinter as adults. if only 4 or 5 of them visit the butterflyweed (Asclepias tuberosa). 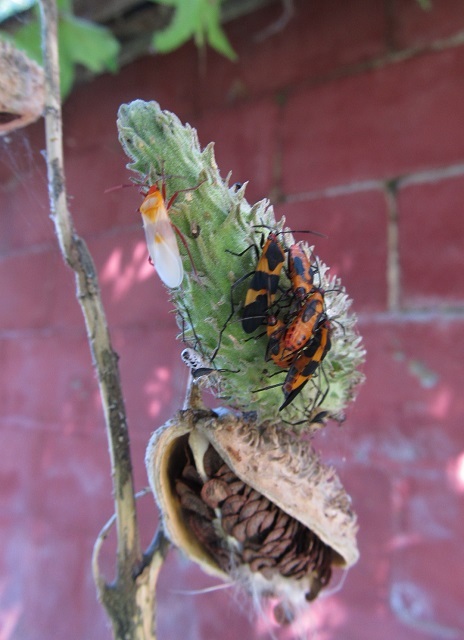 I went outside in the afternoon and found four milkweed bugs on my small patch of the butterfly weed. I took all these pictures between August 20 and September 18 last summer … and am obviously late posting the blog. I’ll be surprised if I see any monarchs laying eggs or find any of their caterpillars. 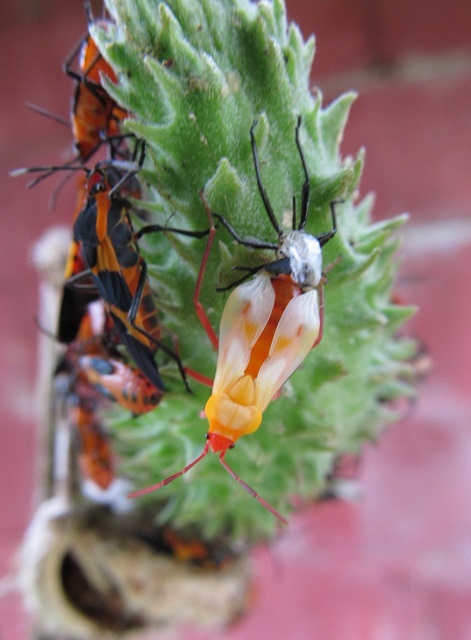 These young ones were the nymphs of large milkweed bugs (Oncopeltus fasciatus). The dark spot in the upper right side of the seedpod was a hole where the nymphs entered to feed. 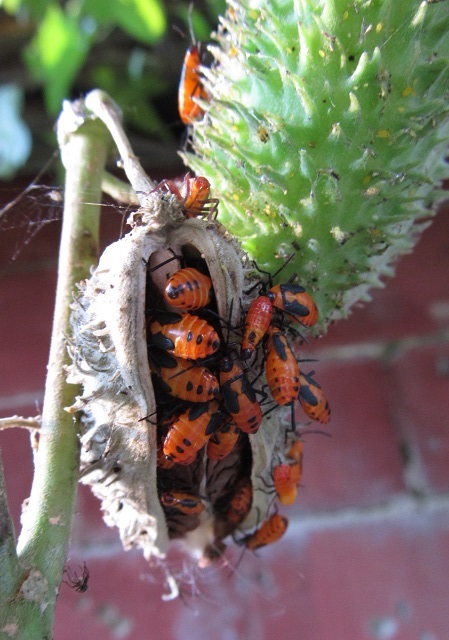 The nymphs fed on the insides of the seeds in the seedpods. Their size and pattern differentiated the ages. Lunch time. There were three seedpods on the common milkweed plant (Asclepias sryiaca). They continued growing. Then I went out one afternoon, and there was one that had just molted. I went out every fifteen minutes to watch the progress in this and the following two pictures. The faint wing colors surprised me. The wings continued to slowly darken. Notice how it used a hind leg to hold the wing in place as it dried. The wing still wasn’t quite dry. 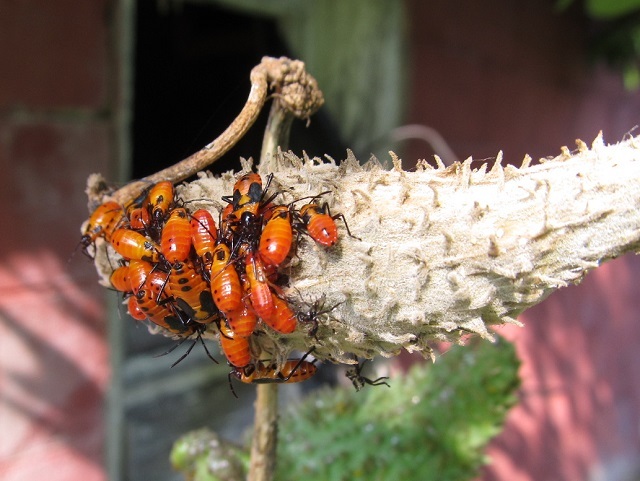 The few remaining milkweed bugs were gone in two or three days. The common milkweed is a perennial. This common milkweed is the same one as in the pictures above. Obviously, there have been no insect visitors so far this summer. I kept thinking “wheel bug” while taking pictures of this bug. Wheel bugs have a prominent semicircular crest on their thorax. Apparently, this one isn’t an adult yet. It was feeding on a soldier beetle. I took this picture in early July of 2009. 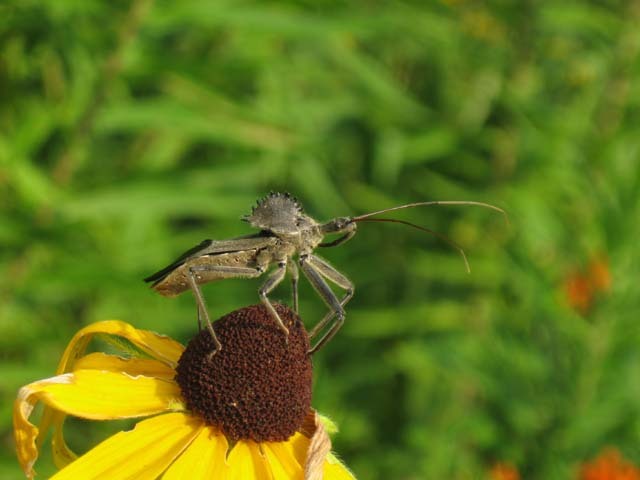 Wheel bugs have one generation a year and overwinter as eggs. 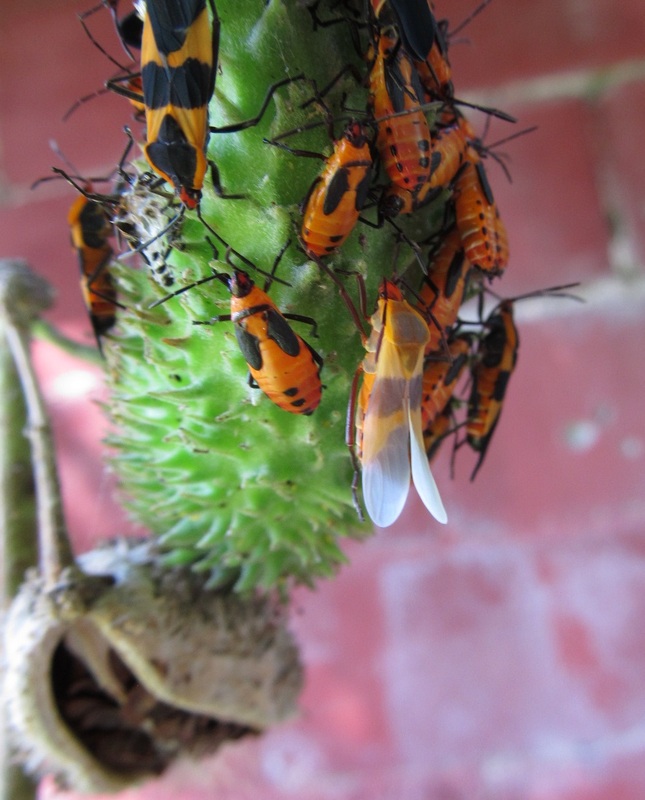 One website stated that the wheel bug’s bite is usually worse than a bee sting. Both nymphs and adults should be avoided. 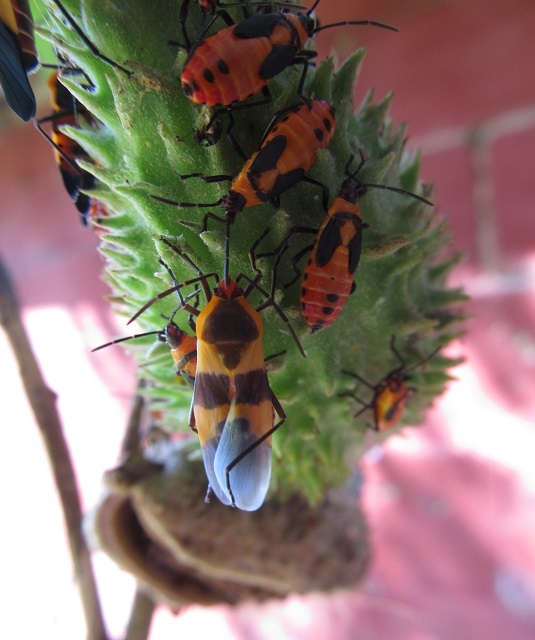 Spittlebugs … and what fascinating little bugs they are. 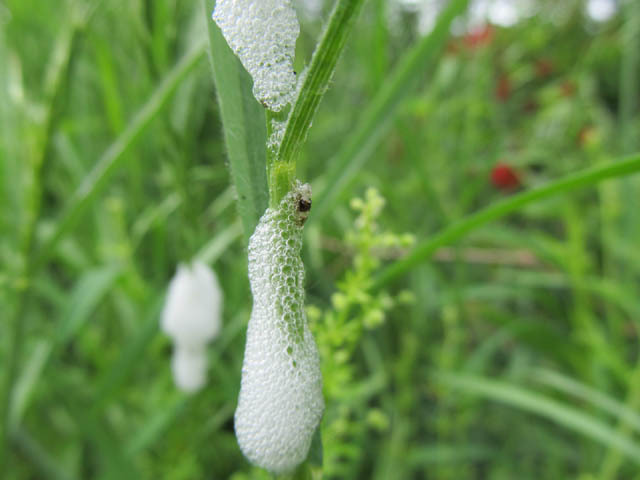 They’re also called froghoppers. The adults are 1/4 inch long and are tan, brown or black. 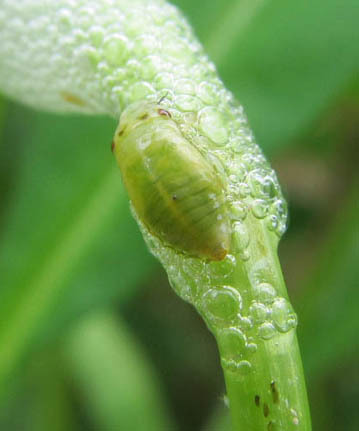 The nymphs feed on plant sap where a leaf attaches to a branch or where 2 branches meet. 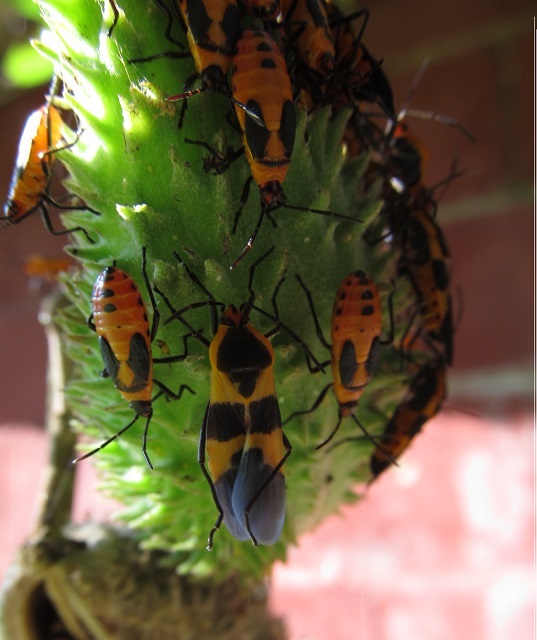 The first instar of the nymphs is orange, the second through fourth are yellow, and the fifth is pale green. 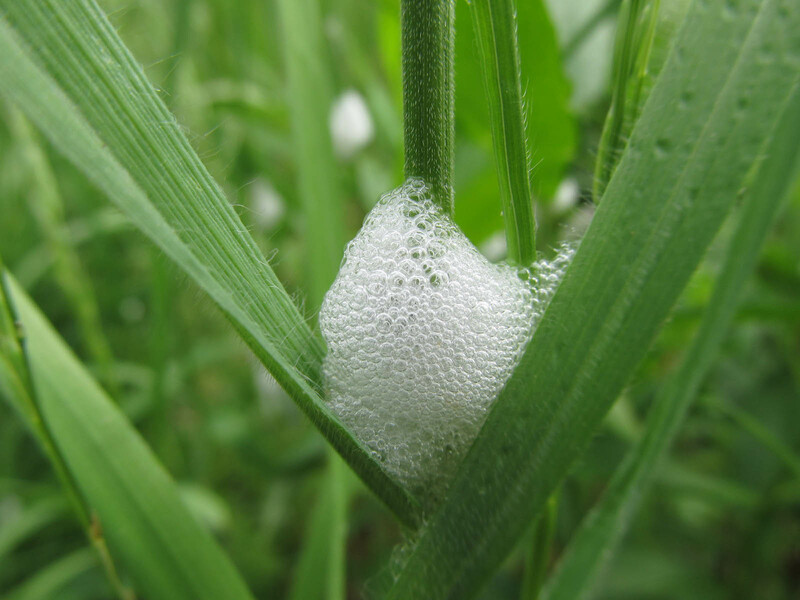 I walked around the yard, seeing spittle mostly on a common tall (unwanted) grass and also on asters, goldenrods, bedstraw and phlox. Then I ended up at the right place at the right time to see spittle that got too heavy and start slipping. Then I found another nymph that had lost most of its spittle. 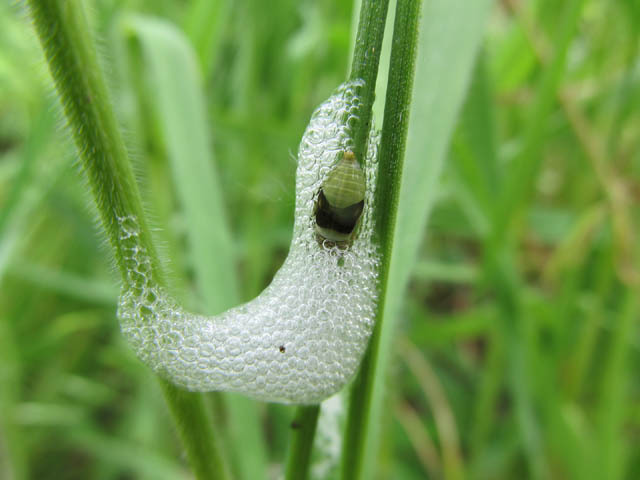 I took picture after picture, trying to capture the spittle “being made.” Apparently the nymph adds air to the sap to form the bubbles. I also found a cooperative, what is probably a fifth instar nymph, not entirely covered with spittle. I learned from observation that the nymphs usually remain with their heads down. That way the spittles’s weight brings it down over the nymphs and protects them from predators. I doubt many predators would like a mouthful of spittle. I know it’s not the most pleasant stuff to come in contact with unexpectedly when weeding.